A week or so ago, our beloved Spring volunteer here at the farmstead, Kate Shavel said goodbye to us to head to her summer job of guiding adolescents into the maritime wilderness outside of Wrangell, AK. Kate was an absolute godsend beyond imagination. Her work ethic, toughness, strength, kindness, and overall good energy will be indelibly stamped upon this landscape. We like to give optionality to volunteers that join us here at The Grove with how they can help us out. One option being, especially during the occasional rainy, wet, and cold periods that can descend upon us, helping create content for our followers. During one particularly cold and rainy day, after slopping around in the garden for a few hours, we suggested maybe she some in and do some indoor work, like writing a blog, since she enjoys writing so much. It’d didn’t require a whole lot of arm twisting before she was at the computer with a hot beverage, thawing out and giving a glimpse of what she’d been up to on the farm and what it meant to her. Please enjoy the following blog from Kate Shavel, written on May 22, 2017. I traveled North to Talkeetna, back to winter at the beginning of April, and was welcomed at The Grove by the sweet Knapp family, a warm and colorful lodge, snow on the ground and Spring on her way. Waiting for the ground to show, I found myself splitting and stacking wood, and indoors, listening to music and planting a plethora of vegetables and trees from seed. We started brassicas (cauliflower, broccoli, kale, cabbage, etc. ), squash, herbs like fennel, basil and cilantro. And grapes, peaches, plums, cherry, and more! 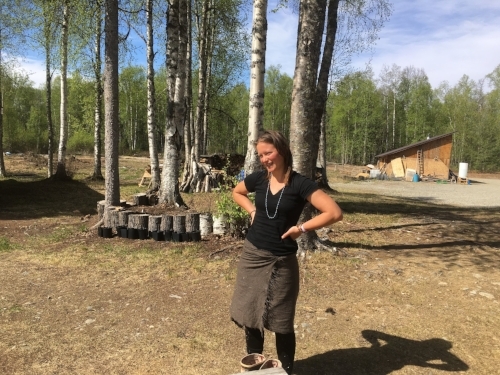 We refresh ourselves with birch water, the slightly sweet and oh so alive sap from a generous birch tree and are reminded of the season of abundance to come with over wintered highbush cranberries and lingonberries. We nourish ourselves with beautiful microgreen salads and farm fresh eggs. I’m so grateful to have found this place and these people and to have enjoyed several weeks of meaningful earth based work. Some projects I’ve been involved with include: creating a hugelkultur bed, turning compost, shaping and amending garden beds, harvesting fiddleheads, cultivating gooseberries, planting a hedgerow of beneficial trees, cleaning out the chicken coop, and transplanting starts. I’ve also gotten to transform pig lands into new growable spaces. By this I mean- clear brush, fill in the pig dug holes and level out the landscape, bring in chicken manure, loosen the soil and take out rocks and roots and then create potato patches, onion beds, squash lands and other vegetable beds and pathways. The spring is now here in all her fullness. I am in love with the sweet fresh scent of the air. All the poplar and cottonwood buds exploding open, vibrant green everywhere. The days seem infinite with all the light leading up to solstice, and this imparts a wild energy full of possibility and potential.